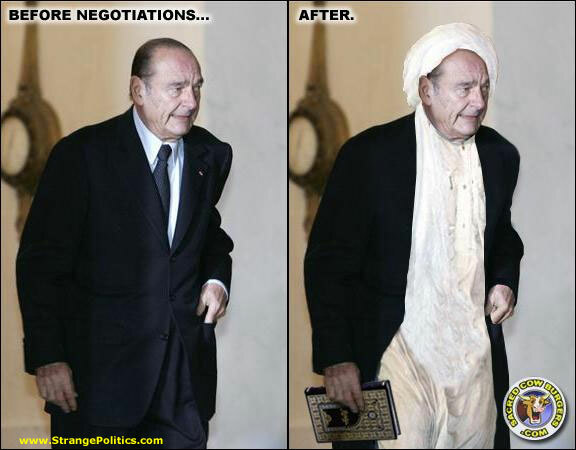 France Surrenders To Terrorism Again …. France, long the shining star for liberal philosophy, policies of appeasement, and the supporter of all things anti-American; strikes again. Bernard Kouchner, the foreign minister of France, said Tuesday that whoever succeeds President Bush in the White House will have to restore the United States’ battered image and standing overseas, the International Herald Tribune reported. Speaking at the launch of a Forum for New Diplomacy in Paris, Kouchner said the United States will never be the country it was before the Bush presidency and will have to work to repair its reputation, especially since the 2003 U.S.-led invasion of Iraq. He added that, although it will take time, the new president will have “many means to re-establish the image” of a country whose reputation is suffering. Kouchner also discussed holding out hope of talking with Hamas, the Palestinian faction that rules the Gaza Strip but has been ostracized by the West and by its Palestinian rival, Fatah. “We have to talk with our enemies,” he said. What nonsense! Islamic terrorists do not want to talk … they want to blow you up or behead you on world television. Kouchner should talk to these guys before making such asinine comments! This kind of stupid liberal thinking is exactly why France has had to be rescued by American forces several times in the past. They always want to talk to their enemies while their enemies are busy killing them (unless of course, they are too busy building nuclear reactors for sadistic dictators … thank God for the ballsy Israelis). I and many other Americans have long since stopped caring what the sycophantic French think! Is Great Britain Part Of The Problem ? The Western world has been shocked by the discovery that Great Britain has raised two suicide bombers of its own: Asif Hanif, who succeeded in blowing himself up in Israel, killing three others; and Omar Khan Sharif, who didn’t (his bomb belt failed detonate) but who nevertheless evaded capture and is now on the run. However, truthfully, no one really should have been shocked. Last week’s incident is not the first example of British subjects being involved in attempted suicide attacks. After their interrogation of members of al-Qaeda, officers from India’s Intelligence Service now believe that there was also a plot to hijack a British Airways plane on September 11 and crash it into the Houses of Parliament. However, that plot failed because by the time the plane the chosen by the terrorists to hijack was scheduled to take off (5:30pm), news of the destruction of the World Trade Center had echoed around the world, and airport authorities grounded all flights. Britain has, over the last decade, given refuge to a host of Islamic fundamentalists wanted for terrorism in countries around the world. Before the attacks on the Pentagon and the World Trade Center in 2001, the governments of India, Turkey, Israel, Algeria, Egypt, Jordan, Yemen, Saudi Arabia, and yes, even France, had lodged protests about Great Britain’s protection of, and refusal to extradite, known terrorists. Those protests, however, were to no avail. Men such as Abu Qatadar (who instructed both Richard Reid, the shoe bomber, and Zacharias Moussaoui, on trial in America for his part in planning the attacks of September 11) were allowed to remain in Britain, preaching, and often organizing, terror plots. Qatadar arrived in Great Britain nearly a decade ago, claiming that he was fleeing political persecution. He was a known advocate of suicide bombings, and was wanted in Jordan for involvement in a campaign of terror. However, Qatadar was granted asylum in Great Britain. Abd Samad Moussaoui, Zacharias Moussaoui’s brother, has described how Zacharias came to England from France in search of work. He was not a fundamentalist, or even a practising Muslim until he drifted into a south London mosque and started listening to Abu Qatadar. Moussaoui’s example has been replicated scores of times. It may even be easier to turn Muslims in Britain into violent fundamentalists than it is to radicalise Muslims in, say, Saudi Arabia: those who already live under a fundamentalist state know from personal experience just how oppressive and destructive those regimes are. Britain is currently the home-base of choice for extremist Islamic preachers, who now have a network of organizations dedicated to sowing pure hatred: hatred of the West, of democracy, and of the values of tolerance and freedom … the very same values that allow them the freedom to operate there. Successive governments in Britain have been warned in the plainest possible terms about the dangers posed by men such as Abu Qatadar, Omar Bakri (who says he “believes in the principle of establishing Islamic law . . . even if this leads to the death of all mankind”) and Abu Hamza (the one-eyed sheikh who lost his hand in an explosion, and whom the Yemeni government wants for bomb attacks carried out there). Why were the warnings so resolutely ignored? Before September 11, the British government seems to have held the view that Islamic terrorism affected Israel and the Arab countries, but not Britain … so Britain could afford to ignore it. That turned out to be a tragic mistake. However, believing that Great Britain was somehow insulated from Islamic terrorism can only partly explain why the British government has allowed Islamic Terrorist leaders to flourish there. Another important reason is the paralysis created by the fear of offending the Muslim community in Britain. That fear has induced a kind of institutionalized political correctness that has prevented the British government agencies from taking the vigorous action that is needed. The fear, however, maybe completely misplaced. There are more than 1.8 million Muslims in Britain. The overwhelming majority are very clear that the violent fundamentalists do not represent them or their religion. They are not insulted if action is taken against firebrands such as Abu Qatadar. They know the difference between Islam and the vicious parody of the religion touted by the fanatics. To think that they do not understand the distinction is to insult their intelligence. Yet that, in effect, is precisely what the British government continues to do. Its measures against terrorists here are piecemeal and ineffective. For example: the British government has outlawed al-Qaeda, and made membership of the organization an criminal offense, but it is still perfectly legal to belong to al-Muhajiroun … the organization to which Asif Hanif and Omar Khan Sharif belonged, and which has an ideology at least as militant as al-Qaeda’s. The British Home Office justified that decision last week by emphasising the importance of distinguishing between “the peace-loving majority of Muslims and the tiny violent minority”. Yet members of al-Muhajiroun are manifestly part of the tiny violent minority, not the peaceloving majority. Who, apart from the British Home Office, confuses the two? Furthermore, the British Home Office still refuses to extradite terrorist suspects. Bashir Nafi, who lectures on Islamic history at Birkbeck College, is wanted by US authorities for “conspiracy to murder, maim or injure persons outside the United States”. The evidence against him includes transcripts of his telephone calls, in which he allegedly discusses the finances of an organization whose goal is to create “terror, instability and panic”, and which has planned suicide bombings. Mr Nafi has not been extradited from Britain. He has not even been arrested! The British government has allowed legal complexities to tie up the process of extradition for years. Khalid al Fawwaz has been wanted by the US for his part in the bombing of its embassy in Kenya. The argument over whether or not to extradite him to the US had been going on for over four years. He has just now exhausted the appeals process (at a cost of £428,000 – funded by British tax-payers). The Home Secretary, however, has still not decided whether or not he will permit his extradition to America. Unless Great Britain can end that dream, they will soon wake up in a terrible nightmare. It is a matter of fact that when Supreme Commander of the Allied Forces, General Dwight Eisenhower, found the victims of the death camps he ordered photographs to be taken, and for the German people from surrounding villages to be ushered through the camps, and even made to bury the dead. “All that is necessary for the triumph of evil is for good men to do nothing.” Edmund Burke in Memorial. The Iranian President, Mahmoud Ahmadinejad, has gone on record and stated that the Holocaust was a “myth” and that Israel should be “wiped off the face of the earth.” This is a frightening portent of the world we will live in, if we elect someone like Barack Obama or Hillary Clinton president. Obama is a man who has also gone on record saying that he will surrender to Islamic terrorists, and will likely pursue a policy of appeasement to radical Islam … much like France does. And France … is fast becoming Europe’s first Muslim nation! It is now more than 60 years after the Second World War in Europe ended; in which 6 million Jews, 20 million Russians, 10 million Christians and 1,900 Catholic priests were murdered, massacred, raped, burned, starved and humiliated while the German and Russian peoples looked the other way! 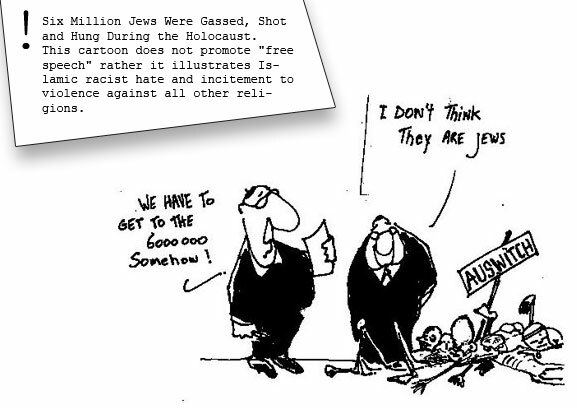 Now, with Iran, among others, claiming the Holocaust to be “a myth” and liberal democrats promising to pull out of Iraq and to surrender in the War on Terror … it is imperative that real Americans stand up and be counted . Or … are you Americans going to look the other way why your Country is taken from you and turned into another France by elitist, secular-progressive, left-wing liberal socialists! Why do you suppose Nancy Pelosi did not allow the House of Representatives to vote on extending the 1978 Foreign Intelligence Surveillance Act, and instead sent the House of Representatives home on vacation? How many years will it be before the attack on the World Trade Center “never happened” because it offends some radical Muslims in the U.S. ? Barack Obama’s pastor, the Rev. Jeremiah Wright, believes we deserved 9/11 … that it was our fault! What do you think Barack Obama believes? Previous PostBits & Pieces Of Liberal NonsenseNext PostIs Obama Going To Be A Major League Flip Flopper Or A Liar?